At 20,000 feet, any fight you survive is a victory...A fully-illustrated oral history of pilots and their planes. From the savage dogfights of World War II to the high-tech missile duels of today, those who wage war in the skies-and the machines they fly-are a breed apart. These are their stories, in their own words. 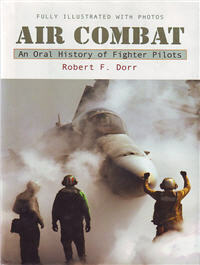 In Air Combat, veteran and military author Robert F. Dorr has collected dozens of interviews from combat veterans who have experienced what it's like to face the enemy in the skies above-from the first days of World War II to the current war on terror. Each story offers a first-hand account of what it's like to be in the thick of the fight, describes the history, strengths, and weaknesses of each man's plane in detail, and offers readers a rare glimpse into the minds and hearts of those who dare to fight in the air.